Be the first to share your favorite memory, photo or story of Mae Joyce. This memorial page is dedicated for family, friends and future generations to celebrate the life of their loved one. 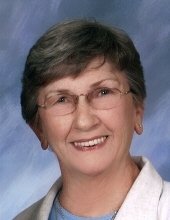 Mae Joyce Neal, 83, of Hopkinsville, Kentucky died at her home 11:30 a.m., Friday, March 29, 2019. Funeral services will be held at 4:00 p.m., Monday at Hughart, Beard & Giles Funeral Home with Rev. Dr. John Birchett officiating. Burial will follow in Powell Cemetery in LaFayette, Kentucky. Visitation will be from 3:00 p.m. until the funeral hour at the funeral home on Monday. Hughart, Beard & Giles Funeral Home is in charge of arrangements. A native of LaFayette, Kentucky she was born on June 20, 1935 the daughter of the late William T. Fleming and Laura Smith Fleming. She worked as a switchboard operator at the Municipal Building for the City of Hopkinsville for over 20 years. She was a charter member of Edgewood Baptist Church. Survivors include her husband: Orville Edward “Ed” Neal of Hopkinsville KY; her son, Orville Edward “Eddie” (Jennifer) Neal, Jr. of Dickson County, TN; her daughter, Sandra (Harry) Ryan of Frankfort, KY; her sisters, Bettye (Jerry) Sherraden of Ward, Arkansas and Nancy (Bobby) Scott of Greenbrier, TN; her grandchildren, Katie Parrish, Lee Watts, Andrea Britt and Kyle Neal; her great grandchildren, Paxyn Britt, Wake Britt, Landen Watts, Lilly Watts and Lucy Parrish. Memorials may take the form of donations to Pennyroyal Hospice, 220 Burley Avenue, Hopkinsville, Kentucky 42240. To plant a tree in memory of Mae Joyce Fleming Neal, please visit our Tribute Store. "Email Address" would like to share the life celebration of Mae Joyce Fleming Neal. Click on the "link" to go to share a favorite memory or leave a condolence message for the family.